These handmade notice boards with plain or printed natural hessian sackcloth are the ultimate in rural recycling. The sackcloth facings are made by reusing empty sacks, for example feed sacks for the heavy horses at our local zoo. Each notice boards is unique, each one a perfect example of ‘up-cycling’. Keep everything from shopping lists to post cards neat and tidy and always to hand. As these are real recycled sacks the writing on the printed versions will definitely vary from board to board! 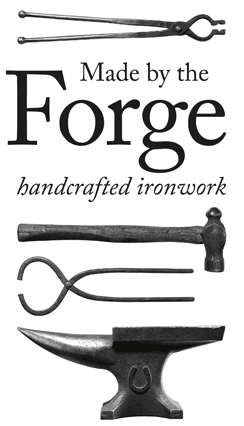 Made by the Forge is a small family run business, handcrafting solid wrought iron curtain poles, kitchen pan racks and lighting. Our passion for quality is our inspiration to produce useful products that will last a lifetime. You can even see the individual hammer marks made by our blacksmith making every item unique. Made by the forge, made to last.